Wednesday May 4th 1898 I was busy with the work all forenoon and drove up town after dinner. I only stopped a few moments. I got a young man at Uncle Jims to help work. It rained tonight. Thursday May 5th 1898 I did the work and practiced some. I went away over in Johns meadow in the afternoon to hunt turkey nests. I come home and fixed a coop to put them up tonight. Friday May 6th 1898 I did a lot of baking and extra work this forenoon and I had different ones for company all afternoon. We hear that Otts folks have a boy baby born at noon today. Saturday May 7th 1898 Will and I took an early start to town this morning. I took time to go over the river and yet get home in time to get dinner. I worked out with the chickens all afternoon. Sunday May 8th 1898 It was a fine day but we did not go away from home. I got us some dinner and read a great part of the day. Ernest & Jennie came about four oclock and stayed till after supper. I had to look after my chickens and turkeys after they were gone. 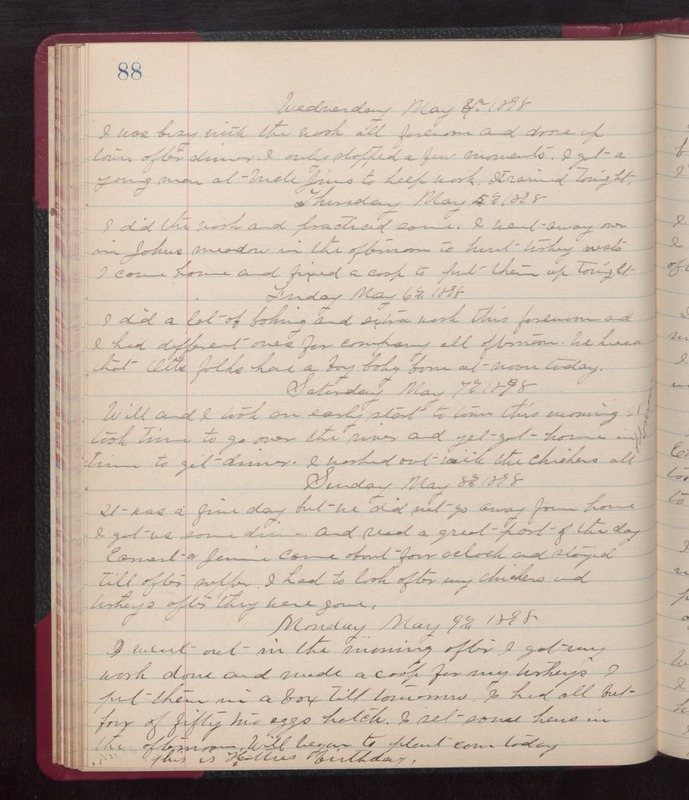 Monday May 9th 1898 I went out in the morning after I got my work done and made a coop for my turkeys. I put them in a box till tomorrow. I had all but four of fifty two eggs hatch. I set some hens on the afternoon. Will began to plant corn today. This is Hatties birthday.